As has been well established, The Sopranos is a highly literary show, and as far as I'm concerned that case is closed. So, let's talk final episode predictions. Everybody's got a theory. Some people I work with think Janice is going to kill Tony, but I can't agree with this. I think Janice and Tony's brother-sister bond goes deep, and I believe they truly like each other. You don't kill someone you've sung karaoke with. This ending would not make sense to me. Others are saying Tony will kill himself, but I don't see that happening at all. Or Tony might actually pull his resources together and prevail over the Leotardo gang. But a surprise "happy ending" would not mesh with this season's ominous forebodings, and it would also fail to provide any real sense of closure. Phil Leotardo only recently emerged as Tony's key nemesis, and it's hardly satisfying to end a show's entire run with a surprise victory against an enemy who wasn't even around during the show's formative years. This ending is not good enough; we have to dig deeper for something that would make sense. My friend John at work made an apt observation that resonates with me: the show's finale might finally give the series title a double meaning if Tony Soprano decides to sing. I think this will happen. He's already been getting chummy with a federal investigator, and he's got few options left. After much thought, I'm going with this theory: I predict that Tony Soprano will attempt to save himself and his family by turning government witness in the final episode. But he won't get off that easy. Sopranos auteur David Chase will have made the decision as to the final disposition of his beloved characters according to his own ideals about what the modern mafia lifestyle means, and the Sopranos basic moral outlook is very much in line with that of the two previous masterpieces of this genre, Francis Ford Coppola's Godfather movies and Martin Scorsese's Goodfellas/Casino twofer. Chase certainly has earned the right to stand next to Coppola and Scorsese, and it's not for nothing that he's been dropping references to The Godfather more than ever lately. This season's opener delivered a big hint when we saw Tony puttering around in his tomato garden (a sure nod to Marlon Brando's great death scene in One). Let's face facts -- before this season, Tony didn't even have a tomato garden. You better believe this means something. You don't open a season with a Godfather reference unless you're going to close it with a Godfather reference, and since the season began with a nod to One I am guessing the season (and the series) will end with a sad reference to Three. Which means that, at some point in his flight to federal protection, Tony is going to watch in horror as poor Meadow gets gunned down. Maybe even on the steps of an opera house. By the way, Yahoo slipped up in its story about the the upcoming last episode, saying Bobby Bacala was murdered in "a toy store". Wrong, yahoos, it's a train shop (but what the hell do they know in California?). 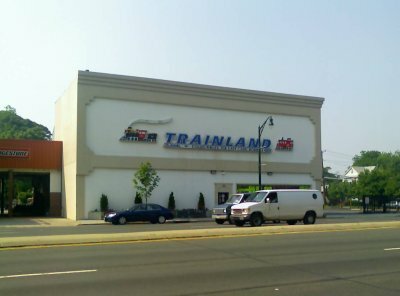 Bobby was shot to death in Trainland, a famous store in lovely Lynbrook, Long Island, which happens to be just about a block away from where I punch the clock every day at my day job. I took the picture at the top of this page just a few minutes ago. Poor Bobby went down in style. I have a feeling the whole show will go down in style too, but it won't be a happy ending. 7 Responses to "My Sopranos Predictions"
In true Soprano style...AJ does what Soprano's do best, growing up like Daddy, and offing his old man to draw the heat off of his family.Tony did it to his cousin, Tony Splendeto, and even to Christofah early this year.It is the Soprano way. What We Know In CaliforniaSeems like everybody knows somebody who knows somebody who works on the show. Rumors are passed among chatty production people. Sometimes they are accurate, sometimes not. (The rumor before the episode where Chris has his "accident" was that Chris was going to die in a car accident. )One rumor going around: a blood-bath, with only Tony and Paulie left standing at the end. Arrested, one of them sings.Another rumor: Paulie betrays Tony, switching to Leotardo's team.I think Levi may have it pretty close. The references to Coppolla's trilogy were all over the place: the music while T and Sil were shadow-boxing (from G3). Another apparent G1 reference: Silvio garrotes Carlo's cousin for betraying the DiMeo family - in G1, Carlo Rizzi is garroted for betraying the Corleone family.Meadow taking a bullet would rip Tony apart. It would rip us all apart, really. During the show's tenure she's gone from a whiny brat to a strong young woman. Such a demise to her forward progress would be truly tragic. But I think it's AJ who will buy the farm. Tony sees so much of himself in the boy, and the troubled son has violent tendencies, has expressed desires to protect his family. AJ will take a hit and that will convince Tony to protect his family by going to the feds.What a show. I'll miss it when it's gone, and I've only got The Shield. jeezAll these endings were far superior to the real one. It's sad to see such a well written show go out with a whimper, if indeed it's going out. I particularly like the Tony's a fed idea, problem is, we've seen him break some serious laws, like murder on numerous ocassions. Could put a damper on a federal career. re: Sopranos...pardon my tardiness..just found site, and perhaps you've already discussed tony &#38; aj's intelligence levels, evident in finale. i LOVED the "yeets" scene. as well as the sake "state" scene. both characters so ignorant, but so lovable in dark, twisted way.